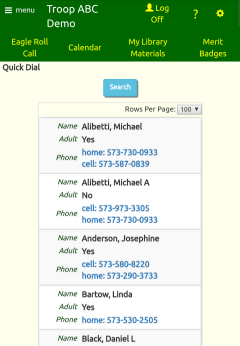 A new Quick Dial page lets you easily call any member of your group from your smartphone. You can now keep track of the shirt sizes of each member. The Last Affirmation Date allows you to record when each member last submitted forms required by your troop, crew or pack. Leaders can enter notes about individual members. Troops can record the Cub Scout Pack each scout came from. Troop 608 of Hamden, Connecticut! Troop 608 just began building out their site in July and it is already quite impressive. They've created nine custom pages which cover just about everything you might want to know about their troop. 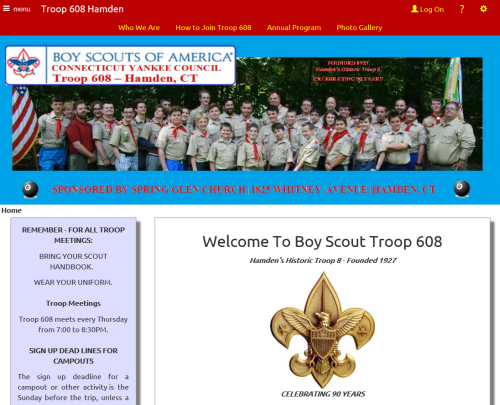 Check it out - you may get some idea's for your troop's site! Please include your troop number and city in your message so we can identify your site.